That's enough from me folks. Thanks for your company. We'll do it all again next weekend. Well, Ian Baraclough and Gary Teale are certainly not happy campers, with both managers far from happy about refereeing decisions today. As ever, we will have online highlights from 18:00 on Sunday and the action will be on Sportscene tomorrow night. "I've looked at it again and his standing foot is on the line and he's cleared it from behind his standing foot. "We had a strong penalty claim when Stephen Pearson was taken out from the knees." The bottom three were all beaten today and have lost further ground with those ahead of them after Kilmarnock and Partick Thistle shared four goals at Rugby Park. The Jags started like a train with a goal inside 70 seconds only to find themselves behind before Frederic Frans found the leveller six minutes from time. "It's a big call. I thought both of Yoann Arrquin's bookings were very soft. If I'm cynical, maybe I'd think it was something to do with getting his red card downgraded last week. I've seen it again (the second caution for diving) and James McPake has stood on his foot. "I'm struggling for words on the second Dundee goal, which was clearly offside. "We need to start coming up with answers about how we get a home win. Today is a massive kick in the teeth because we started well." "It was a hard fought victory for us. Motherwell caused us problems. "Charlie Telfer is getting better game by game and I'm delighted he got his two goals. "I think we can play a lot better, there were a few worrying moments at 2-1. We will need to improve for a huge game next weekend." On Motherwell's disallowed goal, wee Jackie says: "It clearly wasn't over the line". United laboured in the first half against Motherwell but the introduction of Nadir Ciftci gave them more oomph up front and Charlie Telfer underlined his obvious talent with two classy goals. Motherwell will not be happy about a disallowed goal from the first half. It was one of those 'did it cross the line' moments. Aberdeen have been widely praised for putting pressure on defending champions Celtic, so I feel it's only right to point out that Inverness are now just one point behind the Dons after a run of five straight wins. Caley Thistle were under the cosh for much of the first half at New Douglas Park but stepped it up in the second half to run out comfortable 2-0 winners. Hearts have lost their unbeaten record, with Falkirk winning 3-2 in a cracker at Tynecastle. The win lifts the Bairns up to fourth, leapfrogging Queen of the South, who lost 2-0 at home to Hibernian. Alloa and Raith Rovers drew 0-0 and bottom club Livingston gave themselves a shot in the arm with a thumping 5-1 success at Dumbarton. The Buddies teased their fans with the prospect of a first home win of the season after Kenny McLean fired them ahead but the visitors hit back with second-half goals from Gary Irvine and Iain Davidson. The 500 or so visiting fans paying 10p to watch this one will go home very happy after seeing their favourites secure a fifth consecutive victory. Accies started well but slumped to a fourth straight loss. 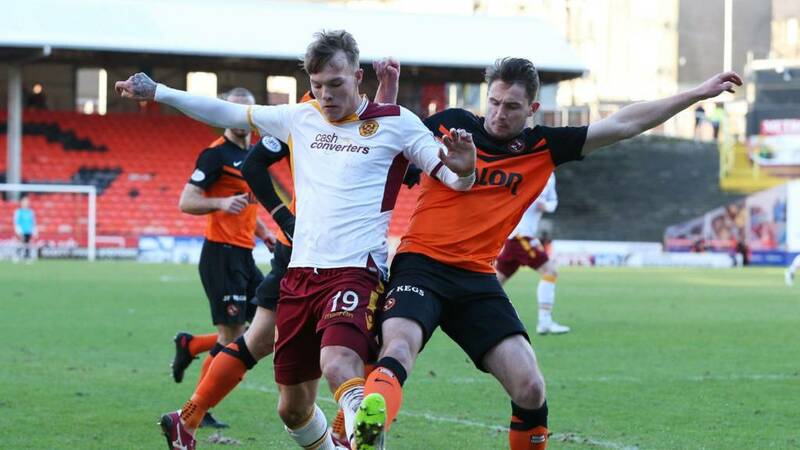 Charlie Telfer scores twice as Dundee United increase Motherwell's worries. That's five defeats on the spin for Ian Baraclough's team. We have a player being carried off at St Mirren Park too and it's Dundee goalscorer Iain Davidson. The stretcher is on for Inverness goalkeeper Dean Brill, who looks in some distress with what could be an ankle twist. Ryan Esson is on for the last few moments. It's game over at Tannadice you would think as Charlie Telfer tucks in his second goal of the afternoon with a composed finish. It's as you were from the teams occupying eighth and ninth in the Premiership. Accies player-manager Martin Canning may be facing four straight defeats but keeps his cool to dispossess Aaron Doran as the Caley Thistle substitute prepares to shoot after gathering a long ball in the penalty area. We're into injury time at Rugby Park as Kallum Higginbotham curls a free-kick over the defensive wall and Killie keeper Craig Samson makes a comfortable save. Well, with all of those Premiership goals flying in, I didn't get time to tell you about James Kaetings' equaliser for Hearts and since then Craig Sibbald has scored for Falkirk again, so it's 3-2 to the Bairns. Scott Robertson has doubled Hibs' lead at Queen of the South with a fine strike and Livingston are now 5-0 up at Dumbarton. Alloa and Raith Rovers are letting the side down with no goals so far. St Mirren striker Yoann Arquin has had a lively start to his career with the Paisley club. He had a red card on his debut rescinded but he's sent for another early bath today, picking up a second yellow card for a dive in the box. Partick Thistle defender Frederic Frans pulls the Jags level, directing Declan McDaid's volley into the net from six yards. Motherwell are right back in it as Simon Ramsden volleys in from Lionel Ainsworth's cross. Caley Thistle midfielder Nick Ross rounds off a lovely move for Inverness as he sweeps home a Ross Draper lay-off from the edge of the box, giving Michael McGovern no chance. Killie captain Manuel Pascali grabs his first goal of the season. A corner lands at the feet of Mark O'Hara in a congested box and he manages to direct it towards the unmarked Italian who knocks it into the empty net. Greg Stewart's pass makes it may through to Iain Davidson and his shot takes a deflection to loop it over Mark Ridgers. Easy as you like. The towering Jaroslaw Fojut lumbers up for a corner and nods in his fifth goal of the season. Sean Sievewright on Twitter: "Most surprising scoreline so far is definitely Falkirk winning at Hearts." The Bairns have come from behind to lead 2-1 at Tynecastle. Can the Jambos hit back and protect their unbeaten league record? Dylan McGeouch tucks away a penalty for Hibernian to give them a 1-0 lead at Queen of the South. Livingston are now 2-0 up at Dumbarton, with Danny Mullen on target. Killie gaffer Allan Johnston is incensed on the touchline as his side are denied a penalty. Robbie Muirhead hits the deck inside the box but referee Willie Collum is uninterested. It's a third goal of the season for Charlie Telfer as the Dundee United midfielder gather a pass from Aidan Connolly and fires a shot into the bottom corner from 22 yards. Motherwell teenager Luke Watt barges his way into the penalty area and just has Radoslaw Cierzniak to beat but fires straight at the goalkeeper. What a brilliant save by Michael McGovern, who touches Josh Meekings' powerful header from Greg Tansey's corner round the post. It would have been cruel on Accies to go two goals down. We have an upset on the cards at Tynecastle as Rory Loy fires Falkirk into a 2-1 lead. Runaway leaders Hearts find their unbeaten record in peril after taking an early lead. With the home side claiming for offside, Greg Stewart looks up and picks out Gary Irvine for a simple tap-in. Both goalkeepers are getting plenty touches of the ball but more from aimless balls into the box rather than from a flurry of chances. The first ten minutes of the second half have been poor fare. In a swift move into the Accies box Graeme Shinnie lashes a shot at goal that is parried by Michael McGovern but the ball comes out and hits Hamilton player Grant Gillespie and ricochets over the line. Official ICTFC on Twitter: "SOOOOOOOOOO close. Not sure how Mckay was denied there." Hamilton's Michael McGovern makes a superb save to deny Inverness striker Billy McKay, whose shot from eight yards looked goal-bound all the way. BBC Sport Scotland Facebook page: "Couldn't call game game at Rugby Park, great stuff. Also, St Mirren lead, first home win of the season on the cards?" Referee Willie Collum must have a hot date tonight since he has the game up and running again well before all the others. Where would St Mirren be without Kenny McLean? The midfielder's seventh goal of the season has the Buddies in front against Dundee as they chase a first home win of the league campaign. Motherwell are celebrating as referee Craig Thomson indicates that John Sutton has bundled the ball in but no, the linesman is standing his ground, and after a quick consultation the game restarts with a drop-ball in the goalmouth. Inverness goalie Dean Brill is at full stretch to gather Tony Andreu's volley from 35 yards just before it crossed the line. Dundee threaten to level straight away but Mark Ridgers is able to tip over Gary Harkins' fierce shot. St Mirren have scored, so it has to be Kenny McLean. BBC Sportsound pundit Chick Young is in raptures as the attacking midfielder shoots the hosts ahead with a low drive from 20 yards. Blair Spittal shows some nice control to fire a shot off and Motherwell keeper Dan Twardzik has to look lively to keep it out. Manuel Pascali thinks he's put Kilmarnock in front with a weak bouncing shot that evades Paul Gallacher. However the assistant referee is quick to put his flag up and cut short the celebrations. BBC Sport Scotland's Facebook page: "Kick-off times are shutting out Scottish football fans. The upcoming Celtic vs Aberdeen match has been moved to a 12 noon kick-off on a Sunday (for TV rights obviously) - the first train from Aberdeen does not arrive at Queen Street till 12:15... it's time for a re-think. " Ali Crawford's waspish presence for Hamilton in the middle of the synthetic pitch is causing Inverness no end of problems. His appetite for the game is infectious. If he's not instigating an attack, he's making tackles or playing the ball out of defence. "Must have the best engine in British football since Terry McDermott," says my colleague Keir Murray, giving away his (middle) age. Falkirk are level at Tynecastle, with John Baird converting a penalty. Josh Magennis makes it all square with a goal that is almost a carbon copy of Thistle's opener. The Northern Irishman is given time and space to pick his spot and his low shot beats the fully stretched Paul Gallacher. After a flurry of early chances in Paisley, the goalmouth action has rather dried up and a few meaty challenges are being exchanged in the middle of the park. Jags full-back Stephen O'Donnell shows a great bit of skill and drives into the box from the right before flashing a shot at goal that Craig Samson does well to block. Partick Thistle are well on top after that very early goal. Inverness like to spray the ball around but the visitors are not being given a moment's rest by the Accies' relentless harrying. Michael Dickson on Twitter: "Three points closer to the league title for Celtic today. #bbcscotfootball"
Greg Tansey smashes a low shot in at the Hamilton goal after a swift break. Michael McGovern gets down sharply to block and, with Billy McKay lurking to pounce on the rebound, Accies get it clear. Stephen Pearson goes down under a challenge from Jarosław Fojut but referee Craig Thomson waves play on. Sportsound pundit Allan Preston reckons the Motherwell midfielder is fortunate to avoid a booking for simulation. It didn't take leaders Hearts long to get going, with Genero Zeefuik firing them ahead against Falkirk after two minutes. With Rangers inactive for the second week running, the Edinburgh side will go 16 points clear at the top if they win this one. Livingston are 1-0 up at Dumbarton thanks to Jordan White. The hosts have made seven changes from the midweek draw at St Mirren and they are well on top in the early exchanges as Motherwell pack players behind the ball. The early signs are Partick Thistle are in the mood to follow up their 5-0 win over Hamilton with another big scoreline. Kris Doolan, the scorer of four of the midweek goals, heads Callum Higginbotham's corner into the side-netting as the visitors do all the pressing. Hamilton Accies midfielder Dougie Imrie fails to connect properly with a right-foot effort at the Inverness goal and the ball drifts into the arms of Dean Brill. Yoann Arquin gets his head on Stephen Mallan's free-kick and Scott Bain makes a smart save to prevent an early goal for the Buddies. It looks like a very healthy turn-out at New Douglas Park, where the Accies are charging fans 10p admission to honour player-manager Alex Neil, who left for Norwich, and assistant Frankie McAvoy, who is joining him in Carrow Road soon. Accies warn on Twitter it's "exact change only, just like on the buses". How long until we get a chant of "We want our money back"? "I think the first half performance was good and the first 20 minutes of the second half. County defended well like they did at Celtic Park and it was difficult to get the tempo up. "But our attitude was good an we worked hard to get the ball back every time we lost it. "We tried to play good football on the floor but the pitch is not so good. We should have scored more so I don't think you can say the win was lucky." Hamilton: McGovern, Gillespie, Canning, Garcia Tena, Hendrie, Routledge, MacKinnon, Crawford, Redmond, Imrie, Andreu. Subs: Watson, Longridge, Brophy, Docherty, El-Zubaidi, Hill, Antoine-Curier. Inverness CT: Brill, Raven, Warren, Tremarco, Shinnie, Williams, Draper, Tansey, Meekings, Ross, McKay. Subs: Esson, Vincent, Doran, Devine, Horner, Polworth, Christie. Dundee United: Cierzniak, Spittal, Morris, Fojut, Dillon, Telfer, Butcher, Armstrong, Connolly, Anier, Dow. Subs: Townsend, Paton, Ciftci, Rankin, Mackay-Steven, Erskine, Szromnik. Motherwell: Twardzik, Kerr, Ramsden, McManus, Watt, Reid, Carswell, Law, Pearson, Erwin, Sutton. Subs: Ainsworth, Nielsen, Moore, Thomas, Cadden, Ferguson, MacLean. Kilmarnock: Samson, Westlake, Pascali, Ashcroft, Chantler, McKenzie, Clingan, Slater, Magennis, Muirhead, Obadeyi. Subs: Barbour, Johnston, Cairney, Brennan, Ngoo, O'Hara, Syme. Partick Thistle: Gallacher, O'Donnell, Frans, Seaborne, Elliot, Osman, Craigen, Lawless, Stevenson, Higginbotham, Doolan. Subs: Balatoni, Bannigan, Eccleston, Fraser, McDaid, Keenan, Basalaj. St Mirren: Ridgers, Naismith, McAusland, Goodwin, Tesselaar, Mallan, Arquin, McLear, Kelly, McGinn, McLean. Subs: Wylde, Osbourne, Reilly, Ball, Kello, Baird, Morgan. Dundee: Bain, Irvine, Gadzhalov, McPake, Dyer, Davidson, Thomson, McGowan, Harkins, McAlister, Stewart. Subs: Letheren, Konrad, Ferry, Clarkson, Tankulic, Wighton, Harris. Could the match against Dundee be St Mirren's first home win of the season in the Premiership? The Buddies' home record is desperately poor - two draws and 10 defeats - and that is a huge factor in their lowly league placing. With County's home defeat by Celtic today, St Mirren remain four points ahead of bottom-placed Staggies, who hold a game in hand. Dundee will give them a stiff test. They are unbeaten in their last four games but away wins are becoming something of a rarity. Their last three points on the road were earned on 1 November at Kilmarnock. Kilmarnock, in eighth place, need to end a run of three consecutive defeats in the league. History is on their side as Thistle have registered only one win and a draw from their last 12 games at Rugby Park. However, there is probably a better time to be facing Partick Thistle, who are one place and three points behind. The Jags are in confident mood after their 5-0 rout of Hamilton in midweek. "It's a very attacking side that we've put out. It's one we hope can cause them problems. Henri (Anier)starts today - we hope to get an hour out of him. Everybody is capable of beating everybody and you have to earn it." The Accies cash room will be laden with silver coins this afternoon. The club is charging fans just 10p admission for the visit of Inverness Caley Thistle to honour the contribution of their number 10, player-manager Alex Neil, who is now in charge at Norwich, and Frankie McAvoy, the coach with a decade's service at the Lanarkshire club. Martin Canning is the new manager at New Douglas Park but will be looking for an improvement on the three games on the trot he lost as interim manager. Third-placed Caley Thistle will surely arrive with confidence. They have taken 13 points from a possible 15 in their last previous five matches with Accies. How Motherwell manager Ian Baraclough could do with a win at Tannadice. Ross County and St Mirren have been jousting at the wrong end of the table for most of the season, but they now have the Steelmen in their sights. Motherwell are only two points ahead of St Mirren, though the Lanarkshire side have a game in hand over them, while County's defeat by Celtic earlier today keeps the Staggies six points adrift of Well. For the hosts, Jackie McNamara's side can be exciting to watch but they have dropped four points in their last three games, which have all been away from home. However, they are still in a fairly healthy league position - in fourth place, they are nine points behind leaders Celtic. Job done for Celtic as they move three points clear at the top. However, it was a bit of a struggle for the champions who didn't get anywhere near the heights they hit against Motherwell on Wednesday. Much of that is down to how well Ross County defended and the league's bottom side will feel hard done by to lose to Kris Commons' deflected strike. We're into three minutes of stoppage time as County win a corner. Jamie Reckord heads over. Will the hosts get another glimpse of goal? Celtic goalie Craig Gordon is down smartly to gather a header from Paul Quinn as a free-kick is hoisted in from deep. County are plugging away gamely as the dramatic rain disappears just as quickly as it arrived. The visitors are making last-ditch blocks in and around their penalty box. Celtic make their final change, with defender Efe Ambrose replacing striker John Guidetti. The Highland weather has taken a distinct turn for the worse, with driving rain replacing the sunshine we had earlier. Ross County are still in this, you know. Liam Boyce cleverly cushions the ball for Scott Boyd on the edge of the penalty area and the defender's strike is snaffled up by keeper Craig Gordon. Ross County freshen up their attacking options for the last 10 minutes or so, with Jake Jervis and Darren Maatsen coming on for Graham Carey and Martin Woods the men trotting off. Ross County forward Liam Boyce has been quiet since he came on at the end of the first half but he suddenly springs to live with a low shot across the bows of Craig Gordon. Celtic replace Kris Commons and Leigh Griffiths with Stefan Scepovic and Callum McGregor. This time Antonio Reguero throws himself at the feet of Kris Commons only for the Celtic midfielder to shuffle past him but before the goal can open up in comes Marcus Fraser with a good sliding challenge. Ross County keeper does a fair impression of Bruce Lee as he beats John Guidetti to a cross from the left from Leigh Griffiths. An unorthodox but effective save. John Guidetti is booked for mouthing off at referee Kevin Clancy - or it may have been for persistent fouling. Either way, it's not been the big striker's best day in a Celtic strip. This time. Ross County are defending a corner and Liam Henderson slams a shot from the edge of the box into the turf. John Guidetti pokes out a leg but can only send the ball wide of the target. Ross County's third corner of the day is headed clear, falling for debutant Marcus Fraser some 25 yards out. Thoughts of a dramatic equaliser against his former club flash through the defender's mind but his shot is high and not very handsome. missed the competitive edge of the Old Firm rivalry, with Rangers trying to climb out of the lower leagues. Celtic goalscorer Kris Commons is booked for angrily hauling Filip Kiss to the ground. Both players get a bit of a ticking off from the ref and exchange a thoroughly unconvincing handshake. Billy Turnbull on Twitter: "#bbcscotfootball I see Guidetti has his shooting boots on in time for Rangers game..."
Stephen Hay on Twitter: "If Izaguirre could cross a ball he'd be dangerous. #bbcscotfootball"
Graham Carey is looking to make amends for that last effort as Ross County win a free-kick 20 yards from goal in a central position. Instead, Martin Woods steps up to fire a woeful effort high and wide. Carey might be on the next one. County midfielder Graham Carey has a pop in search of an equaliser but drags his strike wide. Celtic move ahead and it's down to a huge slice of fortune as Kris Commons powers in a shot from distance. Paul Quinn sticks out a leg and the ball spins off the defender to wrong-foot keeper Antonio Reguero. John Guidetti slips a pass through to Leigh Griffiths and the striker looks certain to open the scoring. However, a weak shot fails to squeeze under keeper Antonio Reguero and Guidetti's follow-up shot cannons off the shoulder of defender Jamie Reckord. We're off again. Will this 45 minutes deliver a few more thrills? Ross County finally join the visitors and we'll be up and running again soon. The answer to that is no. Celtic are out early for the second half and they are unchanged. Mikael Lustig helped himself to two goals and hit the crossbar as a half-time replacement on Wednesday. Will Celtic manager Ronny Deila be getting the Swedish defender warmed up? Mike Heal ‏on Twitter: "Think County will be happier of the two sides at HT. Commons key again for Celtic. Predict a tough second half for RC #bbcscotfootball"
Ross County have not exactly been bursting a gut to get forward but Craig Curran went close with an early long-range effort and Graham Carey's shot needed an awkward save from Craig Gordon. I don't think the hosts will change their approach after the break. It's not been much of a game so far. Ross County are sitting tight and have not really been troubled by Celtic. We've not seen much from visiting forwards John Guidetti and Leigh Griffths. A dusted down Kris Commons lines up the free-kick and his curling effort is expertly pushed away by a flying Antonio Reguero. Filip Kiss is cautioned for a desperate lunge at Kris Commons right on the edge of the penalty area. Miguel Juans on Twitter: "It'll be all about the first goal today #bbcscotfootball"
We all know Graham Carey can hit them and the Ross County midfielder's dipping effort from 25 yards is too hot for Craig Gordon to handle. The ball bounces into the chest of the keeper and away to safety. Kris Commons is felled on the edge of the penalty area and John Guidetti hammers the free-kick narrowly wide of the top corner. Celtic are in a spot of bother defending a corner as Scott Boyd's header travels towards the back post. There are a few hopeful cries for a penalty as Craig Curran goes down in a heap under Emilio Izaguirre's blocking challenge but referee Kevin Clancy is not interested. Emilio Izaguirre gets in behind the home defence and goalkeeper Antonio Reguero is in two minds about whether to come or stay. Ultimately, it doesn't matter since the Celtic full-back hoists the ball high over the target. "I'm sure Ross County will be happy if Celtic play at this pace for the rest of the game. Defensively, County are well-organised." A rare venture forward from the hosts has Celtic's Craig Gordon in trouble as Scott Boyd challenges for a ball dropping from a great height. The defender's header rolls just wide as the whistle sounds for a nonexistent foul on the keeper. It's time for Celtic left-back Emilio Izaguirre to get involved and the Honduran bustles into the penalty area to fire a powerful delivery across goal. Kris Commons throws himself at the zooming ball but can only head high over at the back post. Celtic's full-backs played a big part in Wednesday's 4-0 demolition of Motherwell and Adam Matthews has already been prominent in the visitors' attack today. Adam Matthews cuts in from the right flank to feed Kris Commons and the Celtic midfielder takes aim for the far bottom corner but does not get enough curl on his shot to trouble goalkeeper Antonio Reguero. Ross County boss Jim McIntyre talked about getting "murdered" 5-0 when his team tried to press Celtic high on their last visit. It looks like lessons have been learned as the hosts pack men in their own half in these early exchanges. Celtic midfielder Nir Bitton is robbed of possession and the ball falls to Ross County forward Craig Curran, who lets fly from 30 yards. The shot whistles a few inches wide of the top corner. Graham Carey goes down after catching a flailing elbow from John Guidetti flush in the face. An eye-watering start for the County midfielder. Celtic get the game started in Dingwall, where the sun is shining. Sean Macmillan on Twitter: "I'm going for 4 nil celtic here #bbcscotfootball"
The Staggies have fallen four points adrift at the foot of the table and their home form has been nothing short of abysmal this season. County have lost nine of their 10 league games in Dingwall, including a bruising 5-0 at the hands of today's visitors. Celtic turned in an impressive display against Motherwell on Wednesday to move top of the pile. Ronny Deila's men scored four and hit the woodwork three times. However, it was just a few weeks ago when Ross County left Celtic Park with a precious point after digging in for a goalless draw. Hamilton Accies FC on Twitter: "#10pSaturday It's like a bus - correct change only!! :) Accies v @ICTFC 3pm here at NDP #CanzosAcciesArmy"
"Any time you have a poor result like we did last week, you're looking to bounce bank. We did fantastically well down at Parkhead with a disciplined performance, we'll have to show that discipline again. "We tried to press Celtic high up the park last time they were here and we got murdered. "For some reason we have struggled in Dingwall. We've got to show a reaction from last week. We've got to show plenty of endeavour and commitment." "Stefan Johansen got a cut on his head against Motherwell, so we won't risk him. John [Guidetti] is back. We need goalscorers on the pitch." The Norwegian is asked about press speculation linking him with Manchester United's Darren Fletcher. "It's just rumours," is his reply. Celtic defender Jason Denayer is well wrapped up against the Highland chill. Would you call that a super-snood? Former Celtic boss Neil Lennon has been talking to BBC Radio Scotland and tells Chick Young that he would have no hesitation about returning to the club one day. We'll bring you more from that interview later in the day. John Guidetti returns to the Celtic starting XI after a three-match stint on the bench. The goals have dried up for the on-loan Swedish striker since his blistering 11 goals in 12 games start. Mikael Lustig came off the bench to score two goals against Motherwell on Wednesday following a two-month injury break. The full-back is again among the substitutes. Marcus Fraser, released by Celtic this month, makes his debut for Ross County. Ross County: Reguero, Fraser, Paul Quinn, Boyd, Reckord, Kiss, Woods, Dingwall, Carey, Ross, Curran. Subs: Saunders, Cardle, Jervis, Maatsen, Boyce, Brown, Toshney. Celtic: Gordon, Matthews, van Dijk, Denayer, Izaguirre, Brown, Biton, Commons, Henderson, Griffiths, Guidetti. Subs: Ambrose, Scepovic, Lustig, Zaluska, McGregor, Thomson, Lindsay. Last weekend's snow may have disappeared but it's not quite a full card since Rangers' Championship visit to Cowdenbeath is off, as is Brechin City v Peterhead in League One due to frozen pitches. There is a second inspection planned for Stirling Albion v Forfar Athletic. highly entertaining 1-1 draw in Perth. The Dons are now level on points with Celtic but have played two games more. Good afternoon and welcome to another busy day on planet Scottish football. The action begins in Dingwall, where Premiership leaders Celtic take on rock bottom Ross County. Four more top flight matches follow at 15:00 GMT from Tannadice, New Douglas Park, Rugby Park and St Mirren Park.